The farm holiday has seven apartments, built within the ancient structures of the farm, for a total of 20 beds, fully equipped and renovated, preserving its antique furnishings and te typical atmosphere of the place. Each one is independent and has a own entrance and private outdoor space. Each flat has a bathroom, living room with kitchenette (fully equipped), 1 or 2 bedrooms, terrace or balcony with outdoor furniture. The farm buildings are two plus a tower (a former silos), which overlook a large central barnyard, almost forming a central courtyard. 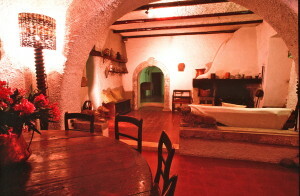 Inside the first building you come to (the one of the seventeenth century) there are: the apartment “Aia”, on the first floor with an arcade and Moorish arches, on the ground floor previously the house is inhabited by the owners, while at the back is the “Dolmen” – on the first floor – and the “manor-House (casa Padronale)” – on the ground floor. Almost next door to this building there is the “Tower” (the former silos, in fact), on two floors. The second building (built on the early twentieth century) begin on the other part of the central barnyard with the “Tavernetta” and immediately after the “Pergola”. Behind the laurel barrier, that separates a portion of the barnyard, there is a staircase leading to the “Majella”, while at the ground floor in the back, overlooking the mountains, there are the apartments “Silos” (north side) and “Canale “(south). The swimming pool, equipped with a relax area overlooking the mountains, is approximately 40 meters from the central barnyard.